In the Future North project one of our core challenges is how to convey the immiment and more distant character of climate change. Today, Janike, Peter and I are attending the annual SAMKUL Programme conference hosted by the Research Council of Norway. The opening session is entitled Cultural Perspectives on Climate Change. What can we expect from one of the most cited and renowned speakers on climate change, Mike Hulme? 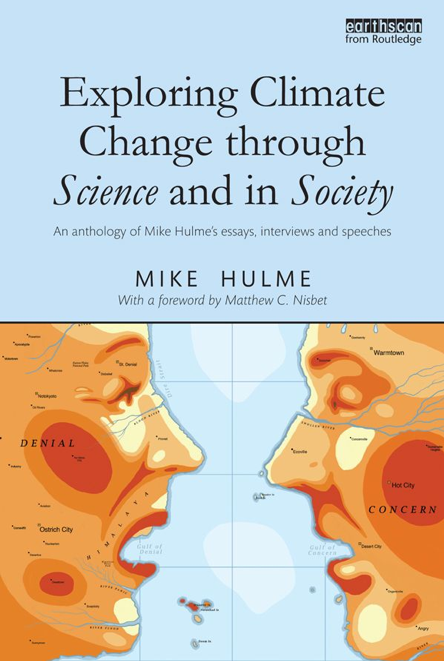 Hulme closes his recent book Exploring Climate Change through Science and in Society (2013) by stating that ‘climate change is everywhere’. Dissensus, difference, and variety is the natural condition of humanity is his main claim. His talk is entitled ‘Seven Cultures of Climate Change’. How different will this be from his earlier text ‘Five Lessons of Climate Change: a personal statement’. These are: 1) Climate change is a relative risk, not an absolute one; 2) Climate risks are serious, and we should seek to minimise them; 3) Our world has huge unmet development needs; 4) Our current energy portfolio is not sustainable; and 5) Massive and deliberate geo-engineering of the planet is a dubious practice. 1. Agency: has been much to do with enumerating, predicting and regulating. All part of a wider modernist worldview and practice. 2. Knowledge: understanding culturally inflected practices and analyses of science is important. The work of the IPPC need to be seen as as choreographed discourse between governments and experts. Metaphor is used in earth systems science, imposing on our understandings of physical reality and policies (Brenda Larsen). 3. Consumption: social and cultural practices and material consumption need cultural analysis. Counter narratives offer potential (Paul Kingsnorth, un-civilisation, a reversion in living styles). 4. Adaptation. This +s to do with responses to perceived and direct risks and processes of change and renewal in human societies. Cultural resources cannot be measured in ways similar to other metrics of climate change. 5. Future: What is at play is working with ‘altering the imaginative ways we engage with the future,’ he says. This is about social imaginaries, linked to ‘tipping points’. How would we become human thermostats, so to speak, using visual imaginaries such as postcards from the future to juxtapose contexts of today with unsettling scenarios. 6. Virtue: This may entail theological views such as that in Virtue as Practices; or, After Virtue, to think about right action in the world; consider here Melissa Lane and the place of the citizen; the animating power of love (C.S. Lewis). 7. Governance: This encompasses the choices in approaches and collective decision making, forms of democracy and governance we deem to be appropriate. This selection extends to earth systems governance, a need to consider ways of subduing the nation state and accentuation of global forms, some argue. Hulme supports finding ways to live together in disagreement. Consensual knowledge does not lead to political and governance consensus though, he observes. He finds useful the recent book Pluralism by Nicholas Rescher.